on beautiful Mara Lake is a luxury vacation condo located on Highway 97A at the edge of Sicamous, BC in the heart of British Colombia’s Shuswap Valley. It is located at the North End of the Okanagan Valley. Located on 2 acres of property with prime west exposure (afternoon/evening sun) beachfront on beautiful Mara Lake, Grandview shores is perfectly located. 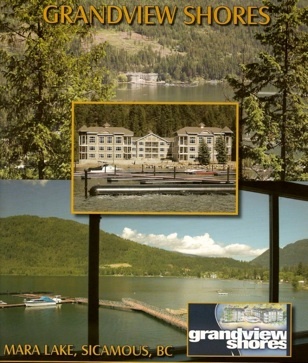 This 41 unit condo development is located on the site of former Mara Lake inn, on the edge of the town of Sicamous, within easy walking distance to downtown shopping. Architecture is tasteful and elegant Cape Cod styling. Amenities include a swimming pool, hot tub, sandy beach, roped off swimming area, and private marina (1 assigned boat slip). Secure underground heated parking (1 assigned stall) plus outside visitor stalls.